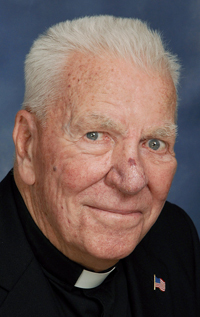 Father Edmond J. Speitel, 93, pastor emeritus of St. Philip Neri Parish in Pennsburg, died April 2. During World War II he saw combat in the Pacific Theater as an infantryman and served as a military chaplain during the Vietnam War. Born in Philadelphia, the son of the late Edmond J. and Lillian (Kohlschreiber) Speitel, he attended St. Helena School and La Salle College High School and then enlisted in the Army. According to a memoir written a decade ago, he helped support his recently widowed mother and his sisters and brother through the military allotment checks paid to his mother. After serving in the Pacific and earning a Combat Infantry Badge and Bronze Star he participated in the occupation of Japan. He was discharged in 1946 and then entered St. Charles Borromeo Seminary. He was ordained May 19, 1955 by Archbishop John F. O’Hara at the Cathedral of SS. Peter and Paul, and his first assignment was as parochial vicar at All Saints Chapel at Philadelphia General Hospital. He also served on the faculty at St. John Neumann High School and Cardinal Dougherty High School. In 1964 Father Speitel returned to the Army as a chaplain and had various postings around the world including Germany and Vietnam. As a non-combatant in Vietnam his duties usually included celebrating six weekend Masses. But on occasion he was in harm’s way, especially taking enemy fire during the 1968 Tet offensive, and he even survived a helicopter crash. After retiring from the military in 1988 with the rank of colonel, Father Speitel was assigned as parochial vicar at St. Isaac Jogues Parish, Wayne, followed by pastor at St. Michael the Archangel Parish, Levittown. In 1993 he was named pastor of St. Philip Neri Parish and pastor emeritus in 1996. He then served as senior priest at Our Lady of Charity, Brookhaven. 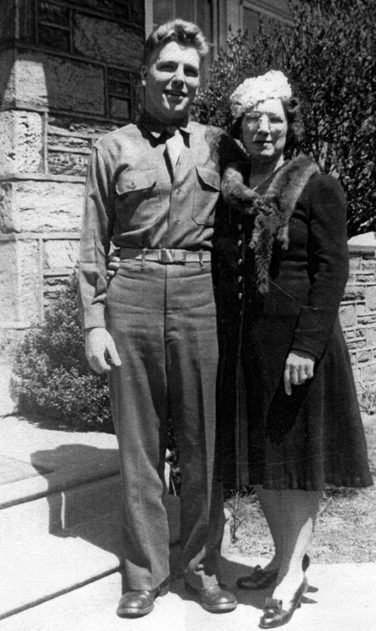 Edmond Speitel spends time with his mother, Lillian, after he completed basic training in the Army during World War II. A few years back Father Speitel gave his chalice to Father Mark Speitel, the grandson of his brother Jerry, at the time of his ordination as a priest for the Harrisburg Diocese. The chalice is a family heirloom because it contains gold and platinum from the wedding rings of his mother and grandmothers. Father Speitel especially loved Ocean City, New Jersey, where he had a summer home. “He would say it was a little bit of heaven,” his cousin said. There will be a viewing for Father Speitel at St. James Church, Elkins Park on Tuesday, April 9, beginning at 8:30 a.m. This will be followed by his 11 a.m. funeral Mass with Bishop Robert P. Maginnis as the principal celebrant. Concelebrants will include Father Wilfred Maloney, Francis Kelly, Raju Pilla and Edward Windhaus, as well as Father Mark Speitel and Father Stecz, who will be the homilist. Father Speitel is survived by his sisters Claire Bonner, Ann McCann and Helene Spause; his sister-in-law Rosemarie Speitel and many nieces and nephews. 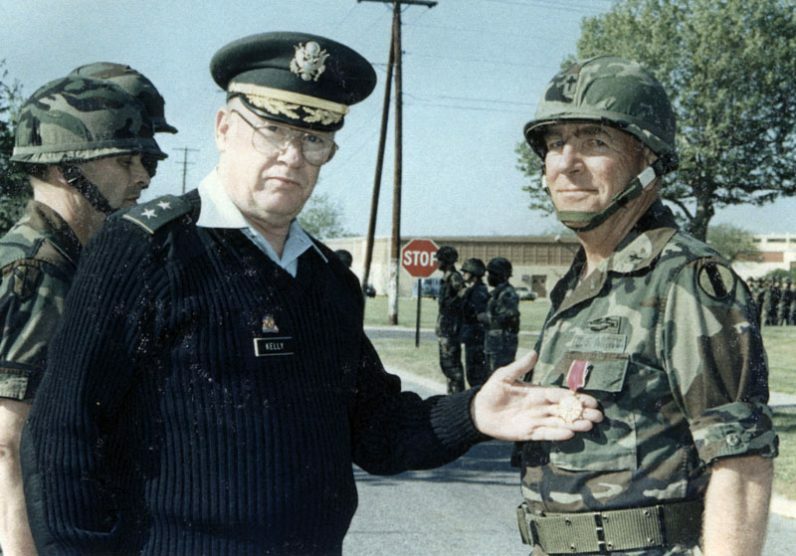 U.S. Army General Thomas Kelly shows off Father Speitel’s Legion of Merit medal in 1986 at Fort Dix, N.J.